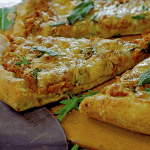 Pumpkin Pizza is a fast and savory treat that has gourmet written all over it. Make this simple recipe for your holiday get-togethers and wow your family and friends! 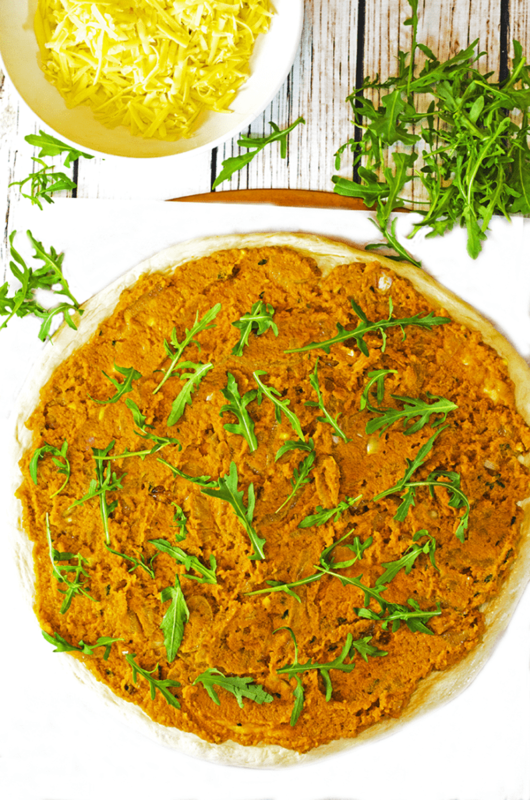 Pumpkin Pizza, featuring caramelized onions, fresh arugula, fresh thyme, and crispy sage. You can serve this pumpkin pizza on Halloween, but why limit yourself to only one day? Savory pumpkin, caramelized onion, and a blend of savory herbs and cheeses make this fall-inspired pizza work throughout the holiday season. 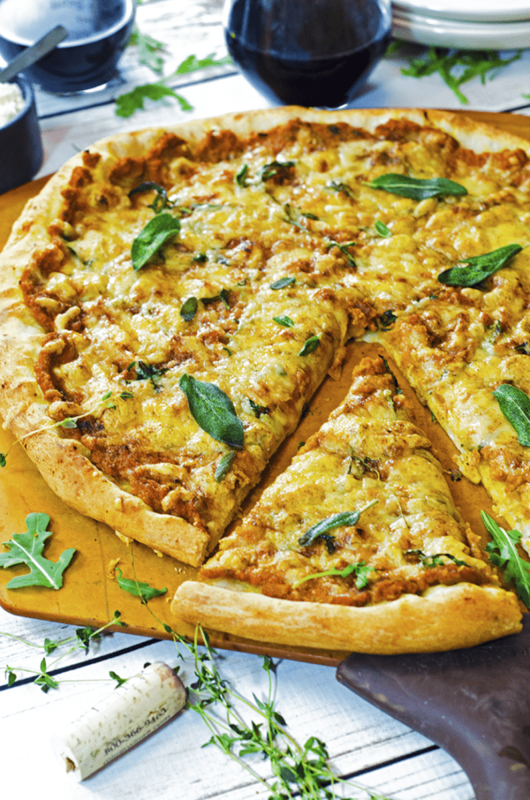 Don’t miss this savory pizza idea that’s tailor-made for fall. What’s in this Scratch Pizza? Looking for that “real good pizza”? Give this scratch pizza a try. 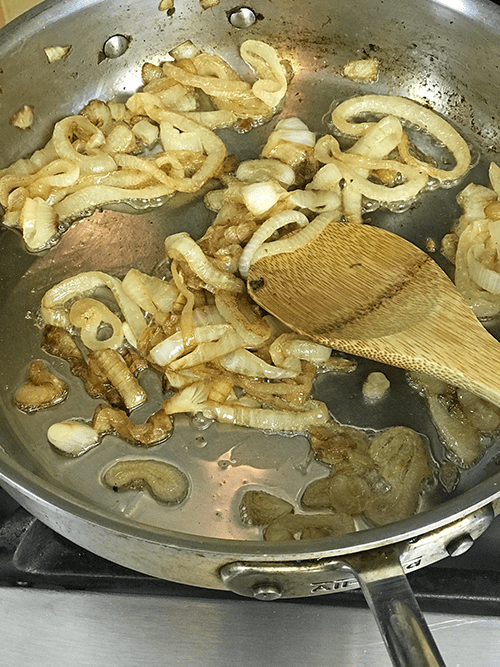 Combine some butter with olive oil to caramelize a sweet onion. Start by caramelizing a sweet onion. To do this, combine some olive oil with butter and melt it together in a large skillet over medium-low heat. Using a combination of oil and butter allows you to cook at a higher smoke point when making caramelized onions. 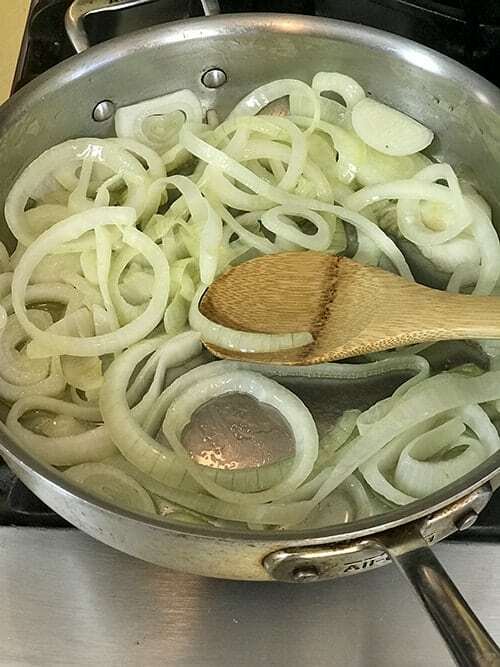 To caramelize onions, don’t over-crowd the pan which will cause the onions to cook by steaming. Caramelized onions take about 45 minutes to get soft, sweet, and gooey. 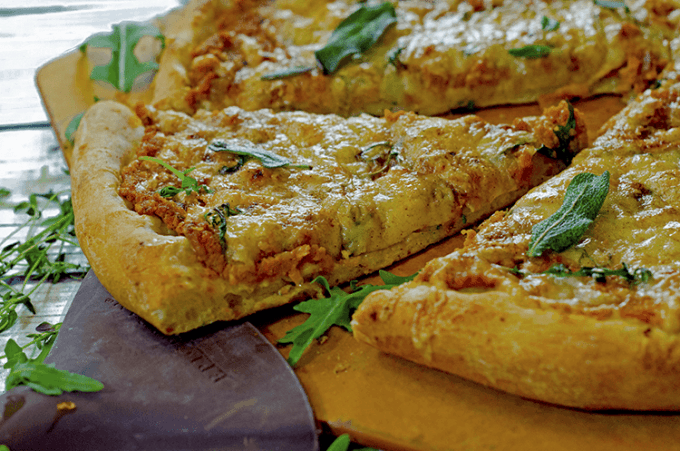 Caramelized onion provides the perfect base for this savory homemade pizza recipe. We talk more about this process in our favorite Patty Melt Recipe. 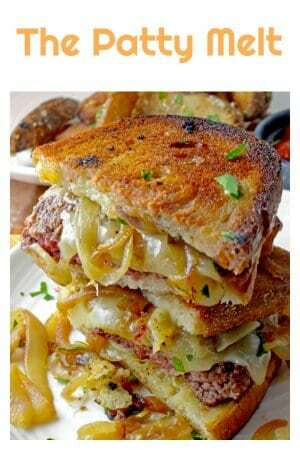 The Patty Melt also uses caramelized onions. 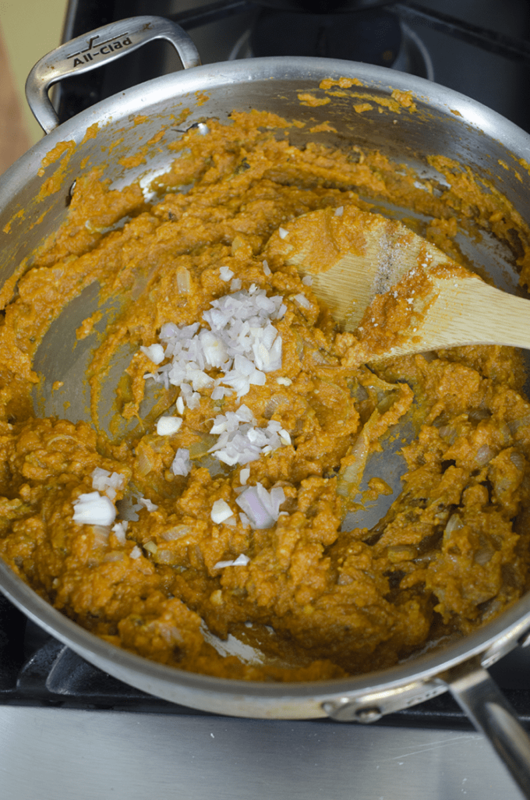 Add pumpkin purée and fresh thyme to the caramelized onions. 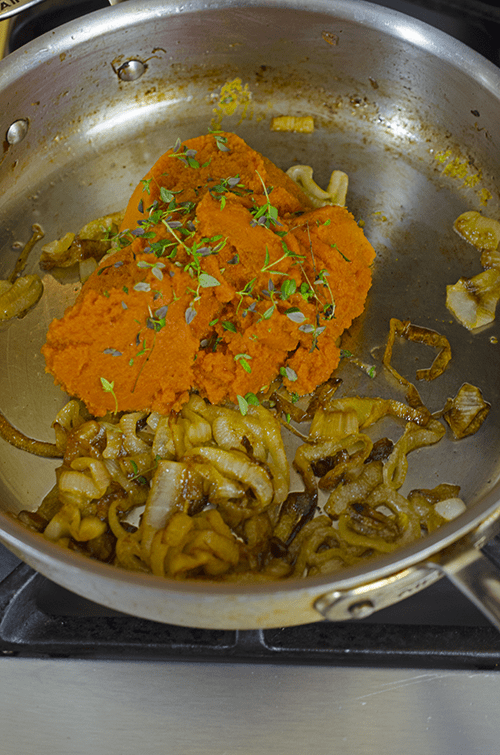 Add a can of pumpkin puree to the caramelized onions, along with some fresh thyme leaves. In case you grow your own thyme, we have an informative article on How to Harvest Thyme, for you to read. Combine about a tablespoon of chopped shallot and garlic to this easy pizza sauce. Add some raw shallot and garlic to this easy pizza sauce. Stir in some sugar and add a little milk to help thin it out a bit, if necessary. At this point, you will also add some freshly grated Parmesan cheese to the sauce. 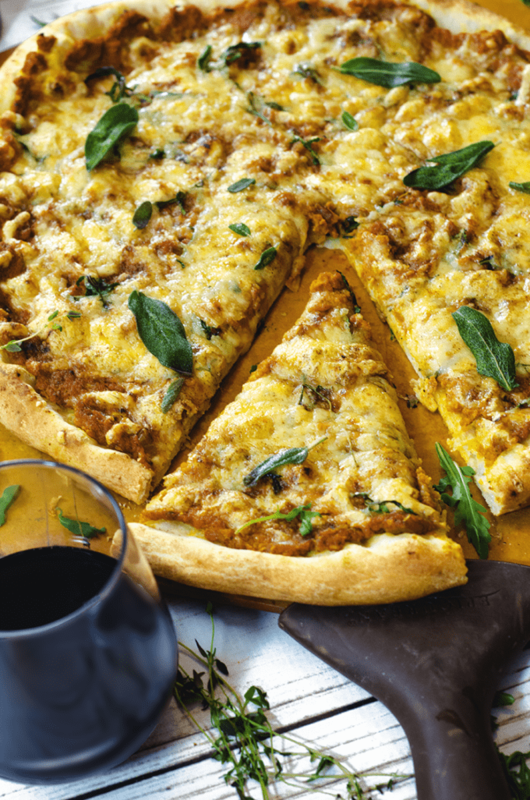 For convenience, use a store-bought crust when making this pumpkin pizza. For years, I would make my homemade pizza crust, inspired by Mario Batali. 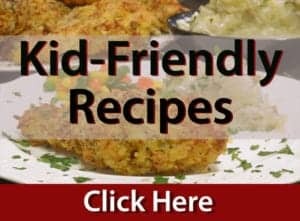 I love how easy it is to make and how great it tastes. Then, I married a man who is a wonder in the kitchen and is all about convenience when it comes to making great food. That’s when I discovered the miracle of fresh pizza dough from the grocery store. For less than $2.00, you can pick up fresh, refrigerated pizza dough and take it home for your homemade pizza. #Whywouldn’tyou?! 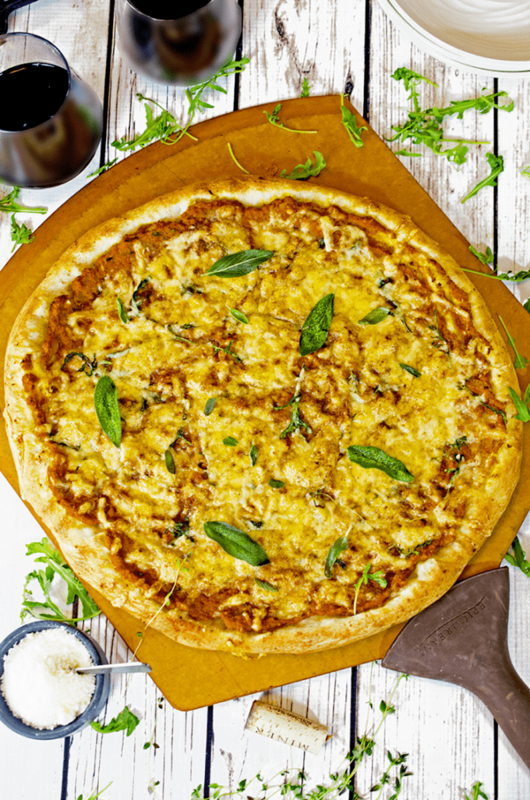 Top this homemade pizza with fresh arugula and Gouda cheese. Fresh arugula adds more fresh and savory flavor to this pumpkin pizza and makes for a beautiful garnish when serving. 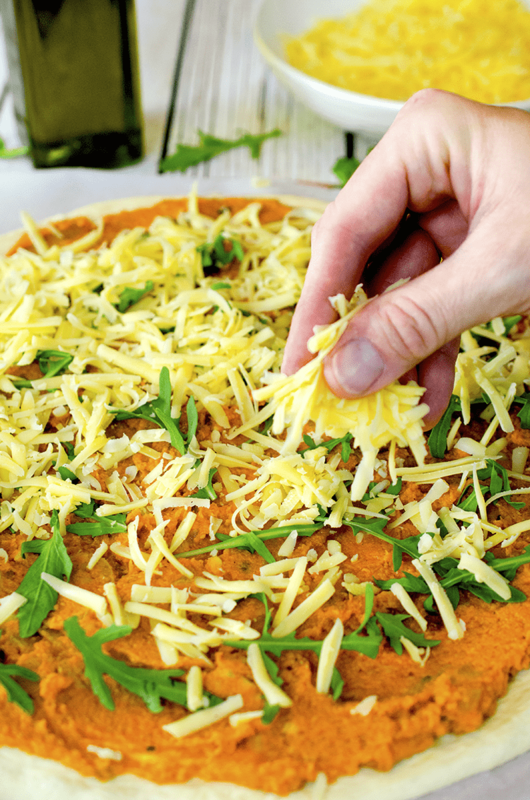 Use a savory cheese, like Gouda, to top this pumpkin pizza. Shred the cheese and load that baby up! Use whatever type of cheese you like to top this pumpkin pizza. We went with a savory Gouda, but you could use a Havarti or even a nutty-flavored Gruyere. Use your imagination and your palate! What’s the Right Pizza Oven Temperature? The answer in short, HOT! Most home ovens will go to 500 or 550° F. This is the temperature you want, if you are using a baking stone, which I highly recommend. Preheating the stone and then sliding the uncooked pizza onto it is the secret to a beautiful crispy homemade pizza crust. It can be a little tricky getting a loaded pizza onto a hot stone, but we have an easy way to do this! You’ll notice that we roll our dough out on a parchment paper. We do this so we can slide a pizza peel underneath and easily transfer the uncooked pizzas onto the piping-hot stone! Easy. Peasy. Delicious. Pizza. Use a pizza peel to transfer the uncooked pizza onto a hot pizza stone. If you are using a metal pizza pan, bake this homemade pizza at 400° as the hotter temperature will cause your crust to burn. Check the pizza after about 10 minutes, that’s how long we bake this pumpkin pizza. 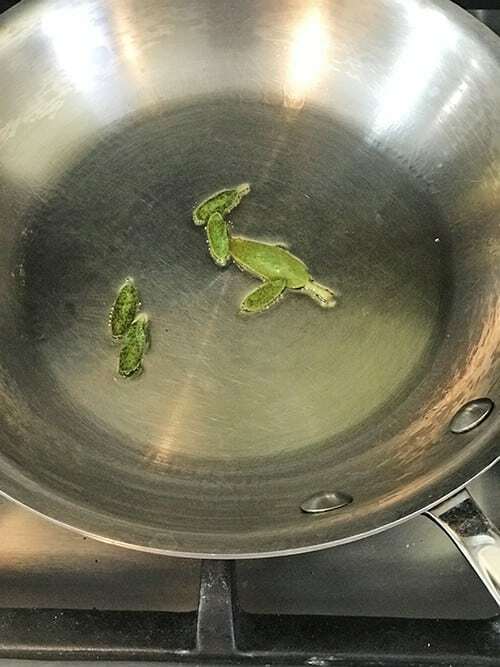 Place some fresh sage leaves in hot oil. 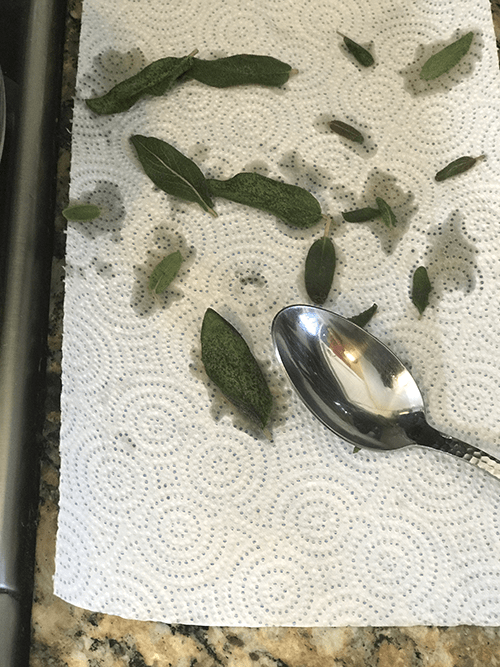 Allow the crispy sage to drain on a paper towel. When this pumpkin pizza comes out of the oven, garnish it with some fresh sage leaves, crisped in olive oil. This adds a beautiful taste and texture to the homemade pizza. While the pizza is baking, simply heat some olive oil on a medium setting and place the fresh sage leaves in the oil for about 30 seconds. Then drain them on a paper towel. This savory homemade pizza can be made in less than an hour! With any homemade pizza, allow it to rest for at least five minutes before cutting into it. This allows the ingredients to settle a bit and for the flavors to meld even further. To take this pumpkin pizza to the highest level of taste, drizzle a little aged balsamic vinegar on top of it, along with a pinch of kosher salt. 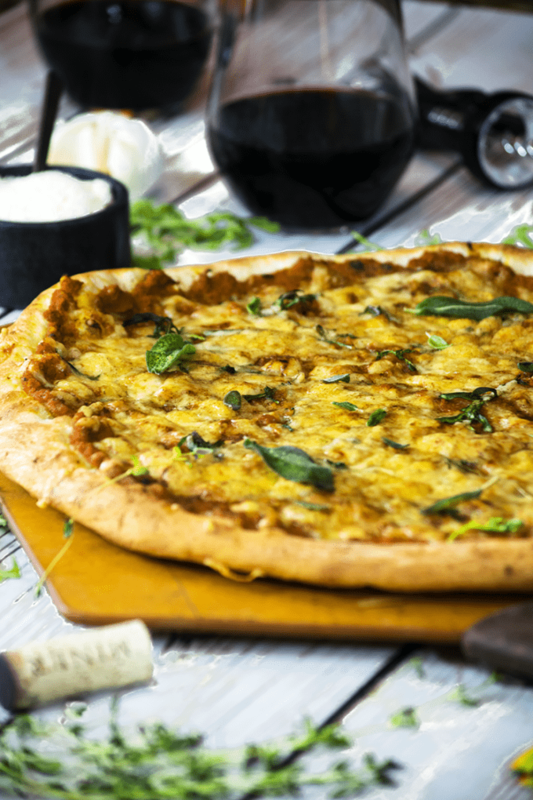 This pumpkin pizza is a must try for the fall season. Savory goodness and convenience make this a fun and delicious homemade pizza. You can put this together for well under $15.00 and not spend all night doing it. This pumpkin pizza makes for a great party appetizer or family dinner, try it and let us know your thoughts! 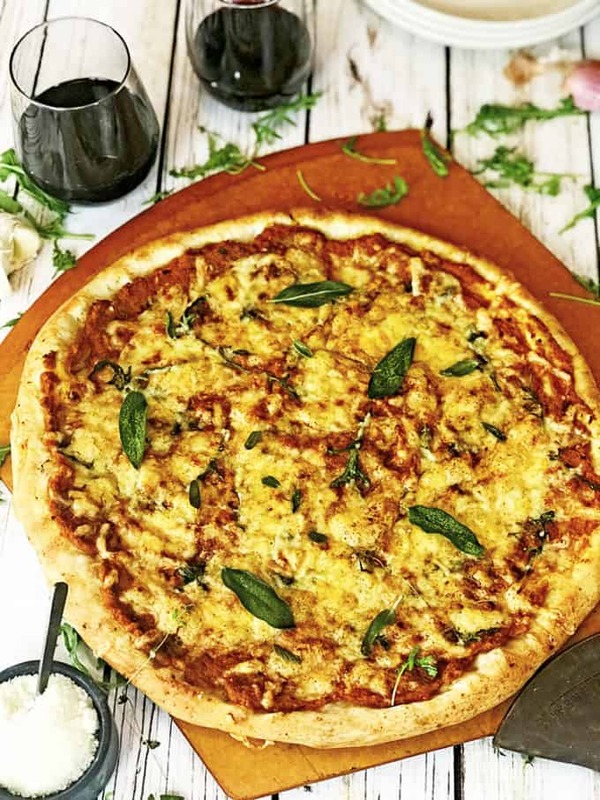 If you're looking for new pizza ideas, this homemade pizza recipe features a store-bought crust, topped with a savory pizza sauce based in pumpkin puree and caramelized onions. Allow fresh pizza dough to proof (rise) at room temperature for one hour. Preheat oven to 500 or 550°, if using a pizza stone. If using a metal baking pan, preheat to 400°. Preheat stone or metal pan in the oven. 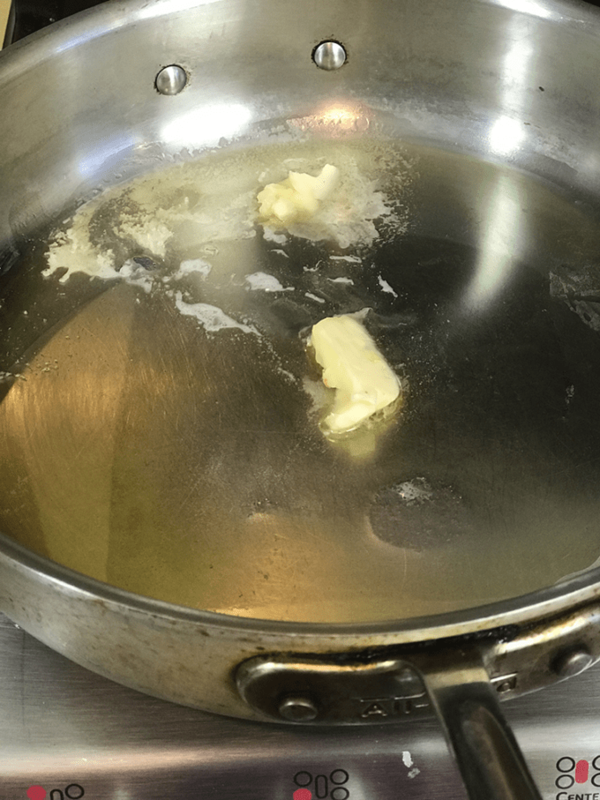 Combine butter and olive oil in large skillet and melt over medium-low heat. Slice onion, at least 1/8" thick and place in skillet. Stir onion slices, over heat for about 45 minutes until brown, soft and nicely caramelized. Add pumpkin to skillet along with thyme leaves, sugar, and milk. Stir pizza sauce and add Parmesan cheese. Remove from heat and stir in garlic and diced shallot. 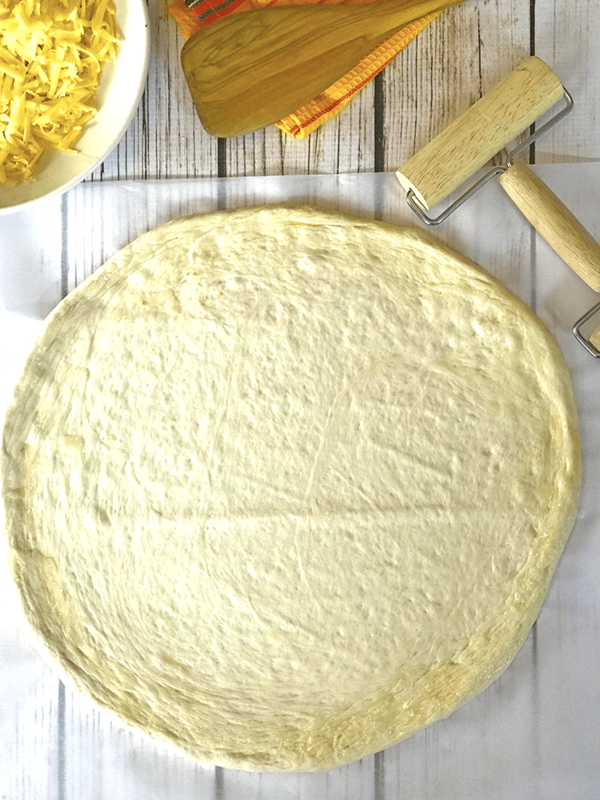 Place pizza dough on large sheet of parchment paper (big enough to fit your pizza stone or pan). Roll out dough to approximate dimensions of pizza stone or pan. Gently crimp edge of the dough and the edge with a dab of olive oil. Evenly spread pumpkin pizza sauce on the pizza dough. Sprinkle top with arugula leaves, add as many or as few as you like. 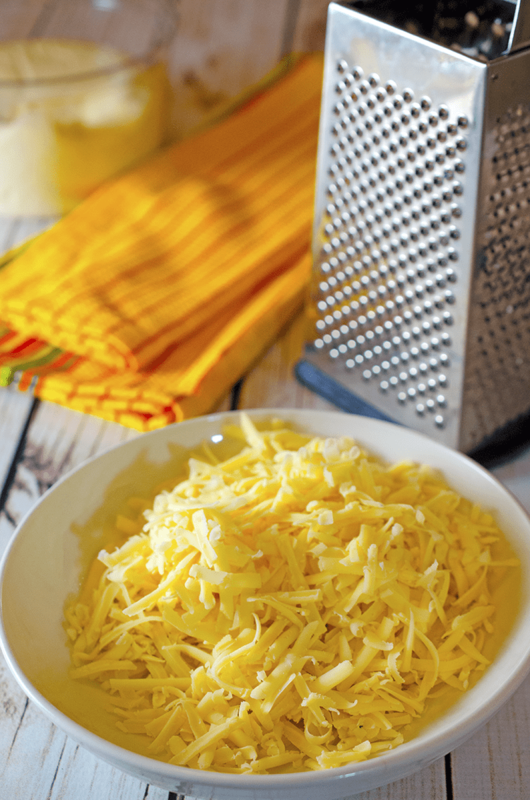 Cover top with shredded Gouda cheese. While pizza is baking, place 1 tablespoon olive oil in small skillet and heat over medium heat. Place fresh sage leaves in hot oil, a few at a time, for no longer than 30 seconds. Remove with spoon and allow to drain on paper towel. 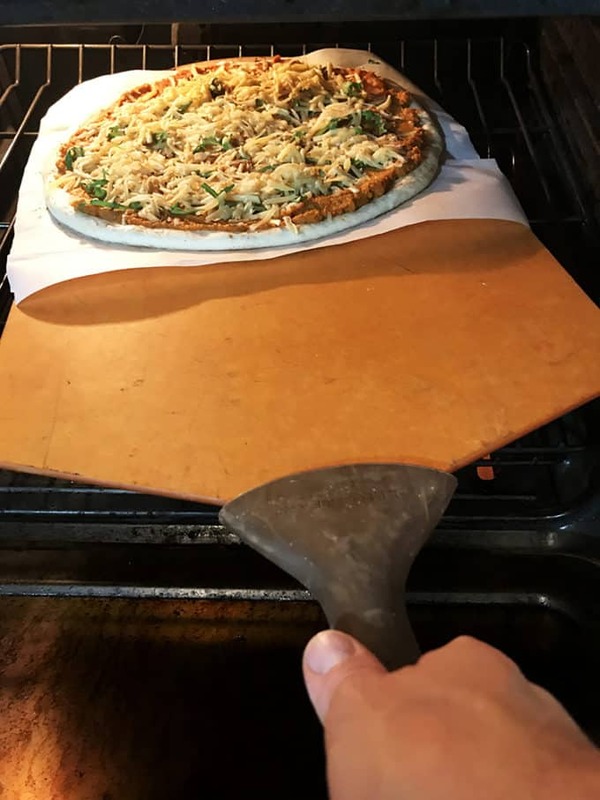 Use a pizza peel to slide parchment paper and unbaked pizza onto hot pizza stone or pan. Bake for 10 minutes. Check the bottom of the crust. If it seems done, remove at that time. If it needs another minute or two in the oven, continue to bake and monitor until done. Remove pizza from oven, allow to rest at least five minutes and then garnish with crispy sage. 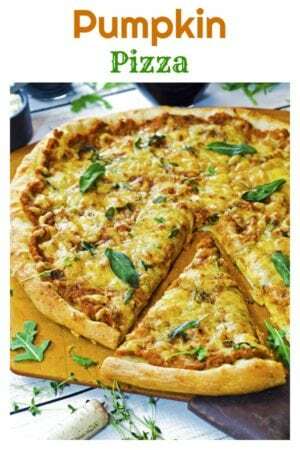 Drizzle each slice of this homemade pizza with balsamic oil and evenly add a pinch of kosher salt. This is one of the most creative recipe I’ve seen for pumpkin week! Love the spicy arugula you added and the premade pizza dough! 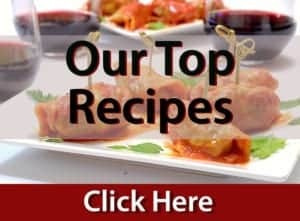 Gourmet-style made easy! WOW! I love this! I would never think pumpkin and pizza, but I want a slice right now Dan!! YUM! I love pumpkin ravioli and this sounds right up my alley! Just made some homemade pumpkin puree and now I have a new way to use it! I can honestly say, this is a new one for me! You have taken pumpkin to a whole new level!! Great idea!! I love when pizza isn’t the same old boring toppings! Pumpkin pizza is genius! Wow!! You guys, this is brilliant!! I never would have thought to make a pumpkin pizza but the flavor combo here is perfection!! A must try for the Fall! Pumpkin pizza? This is such a fantastic idea! Love the caramelized onions and the Gouda cheese. A great combination of flavors for sure! Perfect for the entire season! I love the fall flavors here. I’m not really a fan of tomato sauce on pizza, so this totally works for me. So creative & yummy! Thanks, Debi! This homemade pizza recipe is all about fall, in color and taste.